Do you like the cool sensation of freshness you get when you first set your head on your pillow at night? Of course you do! Everybody does! It is one of the few things in life, like the smell of freshly cut grass or the sensation of rain on your face during a hot summer that everybody will know and love. Problem is that you only get to feel that for a couple of minutes and then it is gone for the rest of the night. An even bigger problem is that some manufacturers have aimed to give us that feeling of cool freshness, with water cooled pillows that ended up giving their users stiff necks and day long migraines. It is for that reason that we tested, checked and rechecked with actual people that have used different cooling pillows until we found those few that have got the balance just right. Here is the good news: there are a few brands on the market today that do offer cooling pillows that actually work. We have found them after a grueling process of elimination and we are going to talk about them in detail further down. For now though, here are our top 3 choices. 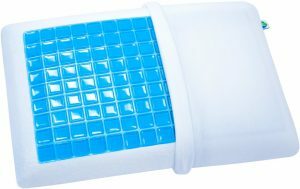 This is considered by us the best cooling pillow on the market! The comfort level provided by a pillow relies not only on the fact that it is cool or not, but also on it being a pillow. That is to say, it needs to be relatively big, it needs to be soft, fluffy, and it needs to provide just the right level of support to your head, neck and back. It is for those reasons that our top choice is the PharMeDoc Memory Foam Pillow. What they did was to start with a great memory foam pillow and add a layer of high quality cooling gel to it. Once you put a pillow case on it, you will not be able to sense in any uncomfortable way that there is a cooling get in it, but you will be able to feel the effects none the less. The gel does not move around, the capsules do not make any extra noise, and you can reverse the pillow, and still enjoy the cooling effect of the gel. As is the case with any product on the market, you may not need to spend a lot of money on the very best product, when the very next best, will be almost as good and cost you a lot less. That is definitely the case when it comes to the Classic Brands Reversible Cool Gel Pillow. It too uses a memory foam core of the highest quality so you get all the benefits that you would associate with that particular technology. It too, has a layer of cooling gel that helps keep you cool and comfortable throughout the night. Finally, it too can be reversed and you will get the same refreshing, cooling experience. The one, big problem we did come across is the fact that it offers different levels of softness. The gel part is medium-firm, while the memory foam side is medium-soft. That may be an advantage if you are going to share your pillow, but otherwise they are just forcing you to use a single side of the pillow. There is a simple alternative if you need to keep your expenses as low as possible: just get the gel part and marry it to your existing pillow. That is why our budget solution is to focus just on the best cooling gel pillow, which would be the Gel’O Cool Pillow Mat. The standard use would be to just put the gel pad on top of your favorite pillow, or just use a pillow case to keep them together. However, the good news is that you can actually use a contact adhesive spray to create your own homemade cooling pillow. The challenge here is that you must own a truly comfortable pillow, otherwise there is no point in buying the 2 separately. You also need to take into consideration that both full cooling pillows we have already featured come with their own pillow cases so those offers are more than fair. On the other hand though, if you are one of the few people who do not like using a pillow when sleeping, or you have several favorite pillows, then the Gel’O Cool Pillow Mat is the perfect solution for you. There are several obvious reasons why most people need a cooling pillow and a couple of not so obvious reasons that will recommend one to almost everybody. When it comes to the obvious reasons, you only need to realize that you spend anywhere between a quarter and half of your life in bed and you will understand just how important it is to make that area as comfortable as possible. But it goes much farther than that because nothing influences you life as much as the quality of your sleep. Lack of sleep or lack of restful sleep has been associated with depression, obesity, and lack of job performance, to mention just a few. So the better, the more comfortable your sleep is, the better the rest of your life will be. The other problem is that our brains are designed to shut down most of their functions during sleep, which means you will forget a lot of the minutia of what is going on around you while you sleep. It is one of the reasons why most people do not remember their dreams. So, for every time you remember waking up in the middle of the night, feeling too hot, turning the pillow upside down and enjoying that fresh, cool sensation, there will be at least 10 other times that you will not remember. You may even spent an entire night just tossing and turning, wake up in the morning not rested and feeling sticky and sweaty, and that may be because you never actually woke up enough to flip that pillow or push the blankets off. Another reason for buying a cooling pillow, may not be so familiar to most people. There are several scientific studies that prove we sleep better at a slightly lower temperature. It is may not be comfortable to wake up in a cool room, but the science says your sleep will have been much better, if you felt that you needed to keep the covers on and around you all night. Setting aside the fact that such a temperature may not be easily reached in the summer – because who wants to sleep with the air conditioning on? – there is also the fact that our homes are much too warm in the winter. So by using a cooling pillow you are making sure that your brain, which is the part that needs the sleep anyway, is staying at that lower, comfortable temperature that allows it to rest. As you may have noticed we did not pick the most expensive products on the market but we did not choose the cheapest either. We did not pick the most expensive because there are several cooling pillows where you are paying more for the advertising that they put into their brand than for the pillow itself. However, with the cheaper alternatives there are several reasons that have kept us away. For one thing, the cheaper cooling pillows use water instead of a cooling gel. 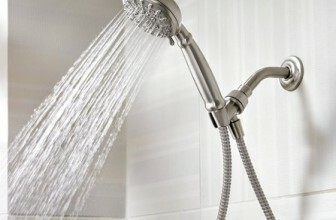 Water retains heat quite easily so, after a couple of hours of sleep your pillow will be just as hot as ever. Some people have tried keeping the pillow in the fridge for a couple of hours before sleep so they would give the water a head start on the heat of the night, but the extra cold only gave them sore necks and headaches the next day. So the fist take away here would be to stay away from water cooled pillows. The other thing to avoid with cooling pillows are the ones that make noised when you move. Because your ear is pressed right against the pillow, any slush from the liquid inside, any crankling noise from the plastic container, will be picked up and amplified. So, if you do not have the chance to actually try out the pillow before buying, look for air bubbles trapped in the bag, and for saggy parts of the bag. Also, check out reviews from other people and see if there are any complains in that department. We did all that for our top choices, so you could just pick one of the three pillows we have already talked about and that we are going to review in depth a little further down in the article. Finally, you should check out the size of the pillow. Most pillows are white and, if you cannot find an appropriate pillow case, they are going to get dirty and disgusting so much faster than you could imagine. So you need to make sure that the pillow comes with its own pillow case, and ideally you have the option of buying a second case from the manufacturer. Alternatively, you should check that the pillow size is standard so you can buy as many pillow cases as you need from a third party supplier. 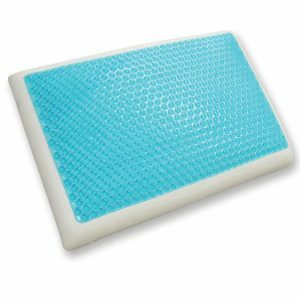 As we have mentioned before our favorite pillow on the market today is the PharMeDoc Memory Foam Pillow with Cooling Gel Technology. There are several reasons why we love it and we are going to go into them, but before that we should point out that this is their standard model. Both in terms of size and firmness this is what most people would recognize as a pillow and would feel comfortable with. However, you should note that there is a second model that is firmer and that has the specific design engineered for people sleeping on their back or on their side. The details that we are going to talk about though, are just as significant when talking about the standard pillow as they are when talking about the firmer model. The first thing that drew us to this pillow is the fact that it is made from the highest quality memory foam. That means the pillow will adjust fairly quickly to your body and will provide a customized level of support both to your head and neck. Of course those are standard features for most memory foam pillows, but that is precisely why we appreciated so much the fact that PharMeDoc included that technology into their cooling pillow. The other side of this coin though is the fact that they paired the pillow with a specifically designed cooling get that well drive away the body heat you generate while sleeping so that any hot flashes you might have otherwise experience will not be felt in any way. You may note at this point that the gel capsules are rather large, especially if you compare this pillow with our other choice, the Classic Brands pillow. The fact is that the bigger the cells are the more cooling gel they will take, so the PharMeDoc actually uses more cooling gel and works better; which is why it is our top choice and also why it cost a little bit extra. The problem most people intuitively have when looking at it is that those cells might become uncomfortable during sleep. However the truth is that, once you cover the pillow in its pillow case, you will not be able to feel the cells. The gaps between the cells can be seen but they were designed so that even the most sensitive person will not be able to feel it. There is also the fact that you can turn the pillow over and the cooling gel tech will still work. So you actually have two very good reasons why you should not worry about the size of the cells. 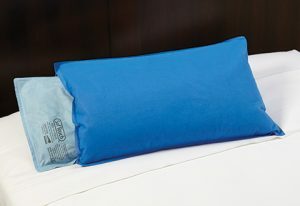 Finally we should mention that the pillow itself is hypoallergenic and BPA free. 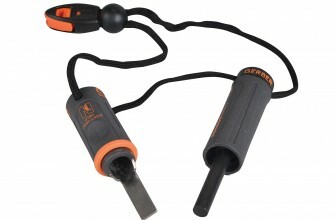 It is also dust mite resistant and lead free. 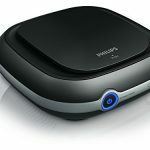 In fact, it has all the features that you would expect to get from a high end, memory foam pillow, plus the fact that it is one of the coolest things to sleep on. Even though we said we would stay away from manufacturers that jack up the price through advertisements rather than the quality of their products, sometimes it is difficult to know where to draw the line. That is why we have created the “for the Money” category. This is where you will find the best nonsense cooling pillow and it is the Classic Brands Reversible Cool Gel Memory Foam Pillow. The PharMeDoc is a highly customized cooling pillow and you need to buy a different pillow whether you want a firm or medium pillow. That may be a feature or it may be just a high end sounding gimmick. Whatever the case may be carrying 2 products instead of one means the PharMeDoc pillow is that little bit more expensive. The Classic Brand pillow though is as affordable as these things go. 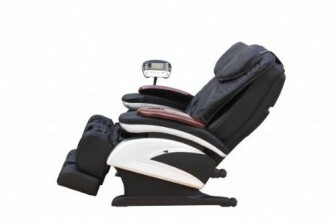 That is to say it is as cheap as a high quality memory foam pillow with cooling gel technology can go. It too deals with the problem that some people like a firmer pillow while others will want a softer alternative, but it does so in a very different manner. They have designed the pillow to use the cooling gel layer. So the cooling gel side is that much firmer, making it feel medium-firm on that side, and it is medium-soft on the memory foam side. Of course that means you will not be able to turn over the pillow while you sleep, but, because of the cooling gel tech, you will not have to. The gel works even if you are using the memory foam side just as well as if you are using the cooling gel side. There is also the question of the size of the cooling gel cells. With the Classic Brands pillow they are smaller so there is actually that little bit less gel being used. However, there is enough gel there that most people will not be able to feel the difference. 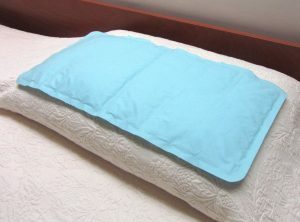 If you are particularly predisposed to hot flashes and you leave in a hot area of the country, or your house is particularly warm, then, yes, you may need to spend a little extra money and buy the PharMeDoc pillow. Otherwise the Classic Brands one is just as good and that little bit less expensive. The pillow itself is designed to provide accurate support for all types of sleepers, whether you sleep on your back, side or stomach, the pillow will feel comfortable. The shape of the pillow is not ideal for people sleeping on their back, but the memory foam is quite good at smoothing out those types of problems. It is also important to note here that the Classic Brands pillow comes with its own case and you can get in contact with their customers support office and request a second pillow case when you purchase. They have one of the most reliable and gentle customer support offices you could hope to deal with. It is very rare when looking for a specific product that you can just buy the core feature of that product and perfectly marry it to your existing portfolio of products, as is the case with the Gel’O Cool Pillow Mat. Think of a Ferrari whose engine you could buy for half the price and just stick it into your family Volkswagen. Luckily though, that is precisely what you can do with a cooling pillow. 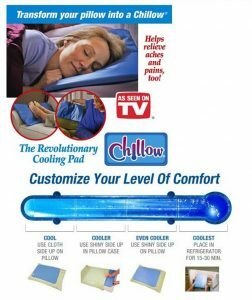 You can buy just the cooling gel layer and attach it to anyone of your existing pillows. There are certain disadvantages though. You will not have the maneuverability of a Ferrari in your wife’s Volkswagen no matter what engine it is using, and you will not have the heat transfer capabilities of a full cooling pillow. So the pillow side of your home pillow will not be as cool as the gel side, in fact it may even not get cooler at all since many pillows are filled with feathers and therefore are excellent heat insulators. But the gel side will definitely be cool and nice to the touch. The great thing we have found out about the Gel’O Cool Pillow Mat is that it is comfortable an silent even when pressed against the ear. It does not use water but the gel inside can actually be refrigerated. As we have talked before it is not recommended to actually sleep on a refrigerated surface but, because it is not a pillow per se, the Gel’O Cool Pillow Mat can also be used as a cold pack. Alternatively you can heat it up in the microwave and use it a heat pack. If you plan on using either one of those features, you should definitely take care that you do not glue the mat to a pillow as the freezing and the heating process will definitely damage the pillow itself. Still, if you are planning just to use the heat transference properties of the gel, which is to say to use it as a regular cooling pillow, we definitely encourage you to use a good, non chemical adhesive to stick the pillow mat to an actual pillow. That is because, even when trapped between a pillow and a pillow case, the mat does tend to move around and curl around at one end of the pillow. 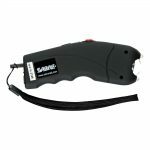 It is not a problem that all users have ran into, but, if you are a fidgety sleeper, you will run into that problem sooner or later. Also, you should note that the Gel’O Cool Pillow Mat does not come with its own pillow case but, because it will fit any type of pillow size, and does not add that much volume of its own, it should work with any regular size pillow you may be currently using. So far we have been talking a lot about how dangerous it can be to sleep on a very cold surface, like a cooling pillow that uses water and has to be refrigerated. However there are those of you who may wonder if even the regular chill level of a cooling pillow is not too much. The answer is that you should not be afraid of sleeping on any of these three pillows just as you would not worry about sleeping on a fresh, regular pillow. That cooling effect lasts longer but it does not get colder, nor does it become uncomfortable. In fact, you may get habituated to the coolness and start longing for an even cooler pillow, but you should resist that temptation since it can lead to harm. Other people have been wondering about the smell of the feel of the cooling gel layer as, indeed, it does not look very natural. However, the pillow is meant to be used with a pillow case so you will not be feeling anything uncomfortable when touching the side with the gel layer. The pillow itself and the gel do not have any specific smells, so there should not be any problems from that point of view. The fact that you spend almost half of your life sleeping or in bed is so well known that most people tend to blank out when they hear of any product that pertains to improve that time. However, just as it was when memory foam first came on the market, from time to time revolutionary products do make their ways into our lives. In the next 10 years we will probably all be sleeping on cooling pillows because they will become the norm. So the question is not if you should buy one, but if you want to wait another 10 years or take advantage of this new technological breakthrough today!